20th October – A big success! 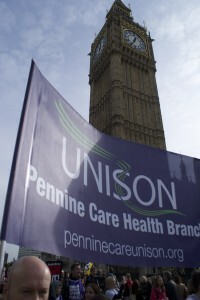 On behalf of Pennine care branch I would like to say a huge Thank you to all who attended the London 20th Oct march. It was an early start for most but we made it through the day to assist with getting the message across for our members. We marched from Embankment to Hyde Park & all lasted throughout the day. It was exciting to see so many people continuing to help fight to save our public services. Branch funded travel down to London along with access to the London tube system and a daily expense for those who attended.